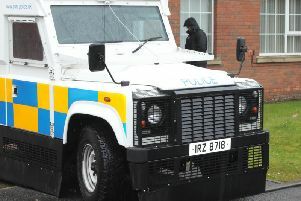 A Lurgan man was fined £600 and banned from driving for a year last Wednesday at Craigavon Magistrates Court for a no insurance offence. And the court ordered the forfeiture of the car he was driving at the time of the offence. Robert Haughian (24), Shankill Street, Lurgan, was also fined £100 for driving without due care and attention on July 9 last year. Haughian did not appear in court and the case went ahead in his absence. A prosecutor said that around 7.20pm police saw the defendant sitting in the driver’s seat of a car and there were two other males in the vehicle. Inquiries revealed there was no insurance in place. Police saw Haughian driving the vehicle and they found the car abandoned in Elmwood Terrace after it had collided with a parked vehicle. Haughian who was walking nearby was spoken to by police and he made no comment during an interview. Convicting the defendant of not having insurance and driving without due care and attention District Judge, Mrs Bernie Kelly, also ordered the forfeiture of the vehicle.